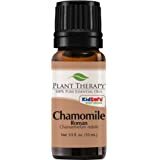 Sold by Organic Aromas Inc and Fulfilled by Amazon. Gift-wrap available. SATISFACTION 100% GUARANTEED – Organic Aromas® offers a ONE YEAR free parts & service warranty. Have a problem, we will fix it! Contact us directly if Amazon will not allow you to return past 30 days. WHY A NEBULIZING DIFFUSER™? There is no stronger or more effective aroma diffuser on the market. Get the purest and most concentrated fragrance across a large area in a very short period of time. WHAT MAKES IT DIFFERENT? Uses ONLY pure essential oil. NO WATER to dilute the scent or to grow mold. NO HEAT to change the therapeutic properties of your oils. NO PLASTIC to leech toxic chemicals. HOW DOES IT WORK? Uses a whisper-quiet, ultra-durable air pump to naturally atomize pure essential oil into millions of tiny micro-particles your body can absorb quickly. 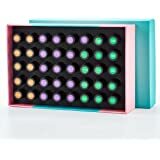 Has an elegant LED rainbow-carousel mood lighting that can be turned off/on. Operating usage cycle (diffuses for 2 mins On, 1 min Off, for 2-hours then shuts off). WHAT’S IT MADE FROM? 100% whole plantation hardwood painted with water based lacquer that will not off-gas and beautiful, individually hand-blown glass reservoir. Measures approx. 5 inches wide (13 cm) and 9 inches tall (22 cm, models vary). Works on 110-220v elec systems. 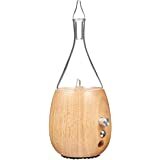 Aromatherapy Nebulizer Diffuser made from Glass and Beech Wood. Pure Essential-Oil Mist for up to 8 hours. 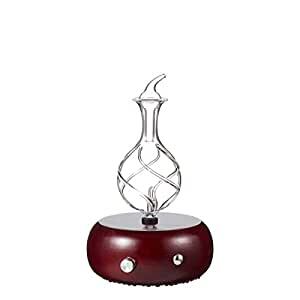 Stylish and Decorative Scent Vaporizer Night Lamp for Healthcare Practice; Office; Veterinary Practice; Home, Nursery. Fits USB power. The only oil diffuser used by health professionals, counselors, therapists, aestheticians and kinesiologists. Pure essential oil is valued for the ability to calm, stimulate, disinfect, deodorize and heal. 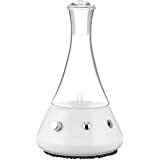 Use this Nebulizing Diffuser™ for multiple applications, including to indulge, entertain, meditate, refresh and remedy various conditions and ailments. 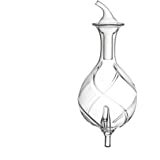 You only need to give your glass diffuser reservoir a quick rinse with isopropyl alcohol once a week to keep the unit in top shape. Do not use thick essential oils, like those extracted from tree resin, or carrier oils, like jojoba, grape seed and coconut oil, etc. Also, do not use synthetic fragrance oils. 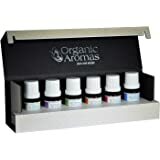 Organic Aromas® backs its Nebulizing Diffusers™ with a ONE YEAR FREE warranty on parts and labor. If you ever have any problem or question, please let us know. We will take care of it! I love that this is plastic-free, water-free and heat-free. It uses a bit more oil but it's really strong. You can adjust the amount it disperses and turn off the LED lights. It does make weird bubbling noises sometimes though which is the reason I took away one star. Also, comes with a small signature scent! I've used it at least once a day since receiving it so far. It has helped a little with my sinus pain but not as much as I had hoped it would. 1.0 out of 5 starsVery poor customer service, Dianna! I bought two of these units. The first arrived not working. Amazon refunded the money as quickly. The second unit worked for a little over two months. I contacted the seller, Organic Aromas, at first the seller seemed to be willing to replace the unit, then contact stopped. I am highly disappointed. I really enjoyed using the unit. I am now have a unit that I cannot use, what a waste of money. 5.0 out of 5 starsLove This Nebulizer! Best nebulizer out there. I have several diffusers as well, and two other nebulizers. I threw my candles away and have been using oils for awhile now. I much prefer the nebulizer to the diffusers for the aroma and therapeutic effects of the natural essential oils. This is a beautiful work of art and the aroma it dispenses is amazing. Really like the lighting in it on my nightstand. I just ordered a second one! The signature scent oil they shipped with the nebulizer is amazing. I hope we can soon purchase the oil. I can't say enough about the EXCELLENT customer service. Make sure you keep it cleaned on a regular basis with alcohol. There is a You Tube video on how to deep clean using boiling water in addition to using the alcohol. It's easy & doesn't take long at all to do. Well worth it. Throw away those candles! 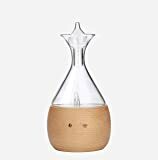 I love this nebulizing diffuser! I got used to the sounds with time. In the very beginning, I could hear the liquid making a strange sort of slurping noise along with the buzzing. That was from the oil vibrating inside the tiny micro tubes inside the glass reservoir. Other times it's a bit quieter and I can hear the sounds of the oil kind of swishing around in there. The strength of the diffuser, controlled by a turning knob, doesn't seem to have a big influence on the sound, although it does buzz a bit louder as the strength goes up. Either way, the operation does go on for a bit, turning on and off in an alternating manner for 2 hours until it turns off automatically. But the light must be turned off manually, and sometimes I have to touch it several times for it to turn off. But usually it's very easy to turn off. So if you're going to sleep with the diffuser running, make sure to turn the light off first. It's better to make it last as much as possible. Many people who review this item complain that the smell is weak. It's true. I use this nebulizer in my closed bedroom only, and I have to sit right by it to smell it well. The scent does spread a bit throughout the room, but it's much stronger if your bed is right next the diffuser. No matter how many potent essential oils i diffuse throughout the day, the smell never becomes overwhelming. People walk into my room without noticing any smells sometimes, even when I'm in the middle of diffusing citrus or other oils. So if you plan to use this in a big open area, I'm assuming it may be a little disappointing. The aroma doesn't linger for a super long time, especially if you have any sort of fan or AC breeze running in the room. 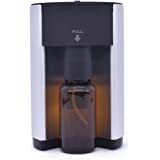 I wanted this nebulizing diffuser pretty bad for a while, and I didn't decide on it until many months later, after I'd looked at everything else and compared, asked questions, researched, and considered options, because of the high price. Because of my chronic illness and my passion for natural remedies, aromatherapy, and herbalism, I wanted something of nice quality. I made the right choice. 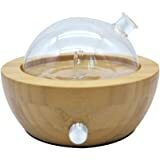 This glass and wood nebulizing diffuser is gorgeous, and the soft, subtle changing colors are soothing. They turn on and off by simply touching a small metal knob on the base. The rounded, light colored wood base is very large in comparison to the reservoir, which gives it excellent stability and balance. The rubber pads on the bottom secure it even more, which is great, especially since I use it on a glass table. It actually sticks onto the surface a bit, making it impossible to slip and difficult to knock over. I have knocked over the small top piece once or twice, but luckily, it didn't break. I feel safe knowing that the diffuser won't be simple to knock over unless I do a dramatic karate kick or take a bat to it. The whole design is elegant and beautiful, and the spiral on the glass is so attractive. If you're really into essential oils and healing, a nebulizer is undoubtedly the best choice of diffuser. With no heat, no water and no plastic, it beats out all the other diffusers that have those features. They can affect the quality of the essential oil droplets you breathe in. You really don't need a humidifying diffuser unless possibly you live in one of a few extremely dry areas. It's conducive to mold and bacteria, and having moist air isn't usually great for you. Breathing in steaming water with Eucalyptus essential oil and a towel over your head is one way you can help your upper respiratory system. Also, you can put an essential oil blend on a washcloth and place it on the floor in your shower, but away from the faucet side. The steam will help you with sinus issues once the hot shower water comes on. But otherwise, most people don't need constant humidifiers. That's not just my opinion, it's also the opinion of many professional aromatherapists. Undoubtedly, the nebulizer is the highest quality essential oil diffuser. I wanted to point out, that on one of the highest reviews on this page, some woman types out a big comparison list between a nebulizer and a diffuser.. which is odd since a nebulizer IS a diffuser, so you can't compare them. I think the problem with many reviews is that people put up false information, they're totally new to essential oils, or they don't keep up with the necessary duties like the regular cleaning a couple times a week, plus the deep cleaning once a month. One reviewer rated this product terribly, and showed a picture of the wood on the diffuser base getting kind of pitted. That's not just from nature... That's from accidentally dropping the essential oils onto the wood and letting it soak in, which you must be careful not to do. That can happenn but you have to clean it right away. It's not fair for the product's rating to suffer from that guy's mistake. Overall, if you can't see yourself keeping up with the cleaning and the maintenance of this beautiful contraption, definitely go with an easier option. If you're serious about your health and about aromatherapy, this is certainly an excellent diffuser to get. However, the company claims to be the ONLY diffuser that ALL therapists and other professionals use, which is just a flat out lie. They say theirs is the best out of ALL diffusers, which is obviously their opinion and nothing more. I think the excessive boasting and obvious exaggerating is unnecessary and unprofessional. The product completely speaks for itself if it's just described clearly and honestly. It's obviously very well made, and the exaggerations simply make the company look desperate. I'm currently diffusing my "dreamy Luxury" blend, which is irresistibly soothing, calming, and relaxing. The blend contains lavender, mandarin, may chang, vetiver, roman chamomile, blood orange & cedarwood (cedrus deodora). It smells incredible! As long as you use pure essential oils, you'll be fine. Don't use synthetic fragrance oils or oils diluted with anything else like water or carrier oil. That can make the machine malfunction. Also avoid using thicker oils such as Sandalwood, cypress, benzoin, labdanum, frankincense, etc. alone. If you want to use them, mix them in an E.O. blend first. Or immediately after their use, do a general cleaning to prevent the inner micro tubes from clogging. Don't use the diffuser in direct sunlight and avoid prolonged continuous use, as the motor may overheat. So for example, let it run the full 2 hours, then take a break for an hour. Make sure you don't add too much oil at one time, or contact with air will cause the oil to oxidize, become stiff and clog the nozzle. Also, make sure to register your warranty at the site in their manual. That will give it a 1 year free parts and services warranty for normal product failure. They say they will not cover "normal wear of LED lights, accessories, and other consumables." Cleaning this product is super easy. I just rinse out the inside of the reservoir with a plastic dropper full of rubbing alcohol. I make sure to clean out the micro tubes especially. I also gently wash the outside and the small top piece with soap and water. Then I let both pieces dry overnight in a glass cup on my shelf, and voila! It's sparkling clean, and totally dry the next day. It takes only about 5 minutes total to clean. The thorough cleaning involves soaking the apparatus in soapy warm water. As long as you're super careful when handling the glass parts, you should be fine. When not in use, I cover my diffuser with a small transparent plastic bag. I just pull it right over to avoid all the dust pileup. It makes it dirtier much faster otherwise. So.. that's about it. Make sure not to rush right into diffusing the second you get this. Definitely read the whole manual to make sure you know how to do it right, like how to insert the glass reservoir correctly into the rubber gasket in the wood base. Do NOT twist it around and around to get it in. You'll read about that part.. just wiggle it gentle, side to side to get it in there. Update: I'm much more used to the noises the diffuser makes, and although it does still get to me occasionally, I absolutely love this high quality machine and it's just not worth worrying about. You will fall in love with it- I already have. Warning. This product comes with a no return policy, and was thoughtlessly made considering its use. Without cautioning consumers that if you get a drop of oil on the woods it will eat a whole in the surface like acid would. How thoughtless. After 10 days, my nebulizer looked horrible, and I gave it away because I couldn’t stand looking at it. Photo attached. This is the real deal. I have been using ultrasonic diffusers and the scents were barely were noticable without adding lots of oil. This diffuser from Organic Aromas is unbelievable. It is beautiful as well as very powerful. My entire house smells wonderful. I am thrilled with this purchase. If you love diffusing oils, this is the only way to go. Neubulizing is by far the best way to use the full potential of your oils. I am blown away! UPDATE; I had an issue with the glass top on my diffuser. I contacted Chad with customer service and he was wonderful. He immediately sent me a replacement top. This company I'd top notch. 10 stars if I could give it!!!! !